And so I fled February, fled winter, as if all the demons of hell were behind me... when in fact they lay directly ahead. Here was my drive to Georgia: DC, snow; Virginia, rain; North Carolina, ice; South Carolina---well, it's South Carolina and doesn't need anything else; Georgia, fog. So much fog. 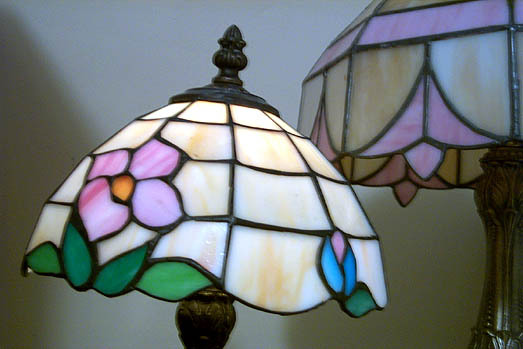 It is a small lamp whose stained-glass shade features very nearly the exact pink and cream colors of Protein's lamp. Between that and its bargain price (twenty dollars! who needs U Street? ), it was obviously meant to be ours. We won't be buying many more glass lampshades, however. Tomorrow I begin my beginner copper foil class at Weisser, which runs through April 5th; two days after that I'll be back with Jimmy at the Art League and doing 3D construction. 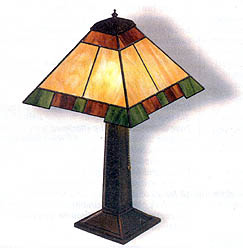 Since I already know that Jimmy is all about letting students do pretty much exactly as they please, especially after having taken one basic class, I think I'm planning to build the panel lamp pictured at right (from Issue #57 of Stained Glass News). Or something like it, probably without the inclusion of any brown glass. Eugh. It won't go with the pink lamps one bit, but the pink lamps don't go with the house one bit, so I call that breaking even. ... but I thought the price for admission to your place was another chocolate puddin' pie!